Reading on a Rainy Day: The Sunday Salon: Are we there yet? Are we there yet? The Sunday Salon: Are we there yet? Are we there yet? Good morning, Saloners! Last week saw a flurry of posts on my blog, thanks to it being Armchair BEA. I don't usually post that often, but it was really a lot of fun to write every day and check out what others had to say. I hadn't planned to take part in Armchair BEA until the penultimate day. I wasn't really sure if I could make the time commitment, since we have family over here and last weekend, we spent about 22 hours on the road. So, while I'm eager to get back to regular programming, I've realized how much I used to love taking part in such blogger events. I also have a giveaway going on which is going to end in a few hours. I'll announce the winner shortly. 4 hours at the airport before departure, doing all the fun airport activities such as check-in, security check, immigrations, customs, and waiting for the flight. Mind you, there are probably about 10 flights to the US all leaving at around the same time. So you probably get the picture of just how many other impatient people you are wrestling with to finish the proceedings. About 23 hours flight including 3 hours layover somewhere in between. These flights usually arrive at big cities, in this case, New York. Yay, now we are in the US! Now another grueling 2 hours while the US officials make sure you have all the proper papers. That's a total of 32 hours already, but hey, we are not home yet. Since we drove, we reached home only 10 hours later, breaks included. When the husband and I travel, we usually take another flight home, which adds about 5-7 hours depending on layovers. So anywhere between 37 and 42 hours in all. Wow - when I put it like that, I don't feel like doing it anytime soon. But in the end, everyone's happy and excited and thrilled. That's really true only when we are going to India or our parents are coming here. The other direction flight generally ends up with us feeling forlorn. The number of tolls we had to pass through is ridiculous! One of them was somewhere in New York and the roads were horrendous. What the heck are we paying for? Having coffee at IHOP at 5 am in the morning is like heaven. The poor waiter was a bit flummoxed when he realized that we only came for coffee and not to eat anything. The husband drove all the way back, but occasionally in my half-awake, half-asleep state, I had this weird feeling that I was driving and that I was seeing cars where there were none and driving past red lights when I shouldn't. Super scary and totally freaked me out, enough to jolt me awake each time, that's all I will say. What is the longest trip you ever made, road, flight, or otherwise? The husband is again traveling this week but this time, since we have a lot of people at home, I shouldn't feel too lonely from an empty home. That will be good certainly. On the reading front, all that blogging last week meant a lot less reading time. I did finish The Joy Luck Club audiobook (even though I didn't like it too much initially, by the end, it did get a little better). I'm now listening to Jo Nesbo's The Leopard. The husband and I also listened to the first half of The Martian during our road trip last week. We need to find a way to listen to the rest, but we love it so far! I also started reading The Girl with all the Gifts sometime last week - that's been great starting, then became a little ridiculous and is now again intriguing. So quite a lot of books going on but none of them international. So wait, did you go to India or New York, or both? I am a bit confused. As for Armchair BEA, it looks like you had a great time. I'm going to check out your posts now. Oh yeah, they are spending a lot of time here to make up for it - 6 months! :-) The Amtrak ride always feels long on the way back. I usually take it to New York and while I'm excited when going there, it feels gloomy on the way back. We are known to go very out of the way to go find a Starbucks, though that's usually when my brother is also with us and he needs coffee. I love the food and drinks part of a road trip more than anything. Half the time, I'm looking at my app and trying to find a good highly recommended local place where we can have lunch or dinner, or even just something to eat if it's not meal time. We went to New York. My parents made the India to New York trip, so we were in New York to pick them up. Armchair BEA was fun! They had some great topics going, so that was nice. That is an incredibly long journey - it must take them days to recover from a trip like that!! Hope they don't need to make the return trip any time soon. Hope to see you at Armchair BEA next year! The event was a lot of fun. Flying to France was a pain when we lived there but it wasn't that bad. Could your parents fly into D. C.? I hope you have a great visit with them!!! Ah, now I see...sorry about that. It was early when I read this and wasn't quite clicking on all cylinders. Ten flights leaving for the US at the same time? Wow! Luv your book blog. We did consider DC, but the flight rates are double what they are to NY. I guess, in a few years, it could get a little cheaper to DC, in which case that would be convenient. It certainly does feel like going to a different planet. Sometimes you enter the plane in daylight and get out also in daylight. Sometimes you enter on Date Z, you exit also to date Z. It's all so weird. Even though Jules Verne's Around the World in 80 days explains that concept so well, it's still really amazing when you think about it. I downloaded the library ebook yesterday and that's epub too. I installed the Overdrive app on my phone so that's probably where I'll read the rest of the book. I'd much rather read the print or on my Kindle, though. How I shudder at the thought of all that travel! My longest was Port Elizabeth, South Africa - Johannesburg - Dubai - New York - Orlando. All told, that clocked in at about 40 hours - an entire work week! That is a major trip! I've never lived more than 90 minutes from a decent airport; the 10 hours travel after landing would really kill me. In high school once we did a school trip from Seattle to Los Angeles on a bus, which took about 36 hours... That was enough for me. I had hoped to participate in Armchair BEA this year, but the closer the event got on my calendar, the more I realized how unprepared I was for it and didn't have the time to get organized. Oh well. There's next year, right? It sounds like everyone had a great time, and that's what matters most, right? I love road trips. It's been ages since I was last able to go on one though. Growing up, we often went on cross-country road trips since my dad's parents and siblings all live on the East Coast and we were always on the West Coast. Mine were never as extensive as yours, however! 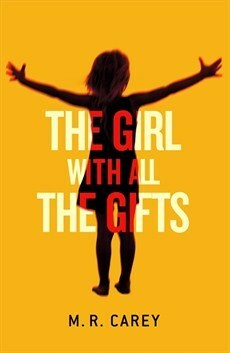 The Girl With All the Gifts is sitting on my kindle waiting for me to read. Based on your comments, it sounds like it will be an interesting read. Oh my goodness! I can't even imagine making that trek from India to the United States. I'm so glad your parents were able to make it, and that going to pick them up is an option. I hope you enjoy having them around! My family lives @ 1000 miles away in TX(we are in FL). Many times we've driven as it's just so expensive for 5 people to fly rent a car, etc. In the past few years I've gone more alone, aging parents, kids in college now. The drive is @ 17 hours, we we break it into two days. Once when our girls were just over a year old we drove it straight thru, leaving our house @ 9pm, and we did stop @ 3am and nap a bit in the van at a rest stop. It was worth it, the girls slept all night. My sister formerly worked for a CO with operations in India and she hated making that long flight over. Ahhh the things we do for family. I hope you enjoy their visit. Never stopped to factor in all of that drive time and airport time into the trip - wow, that really is a labor of love!